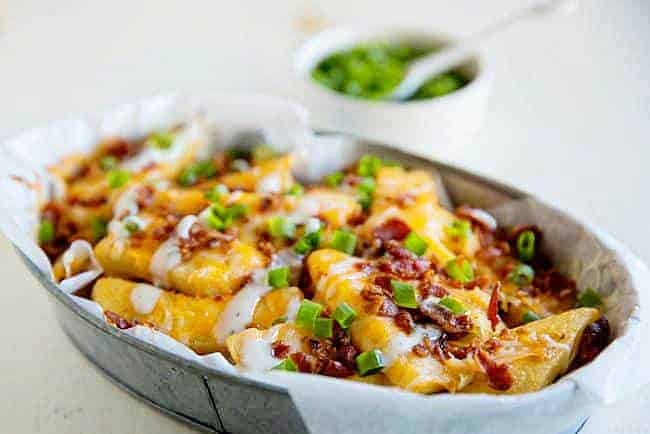 These Loaded Cheese Fries are easy to make and so great for parties, Game Day, and any Friday night! 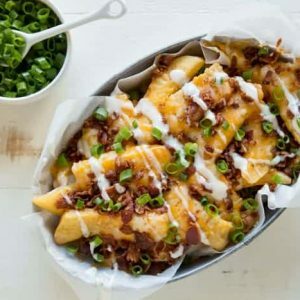 Start with store-bought French fries and top with cheese, bacon, scallions, and Ranch dressing. 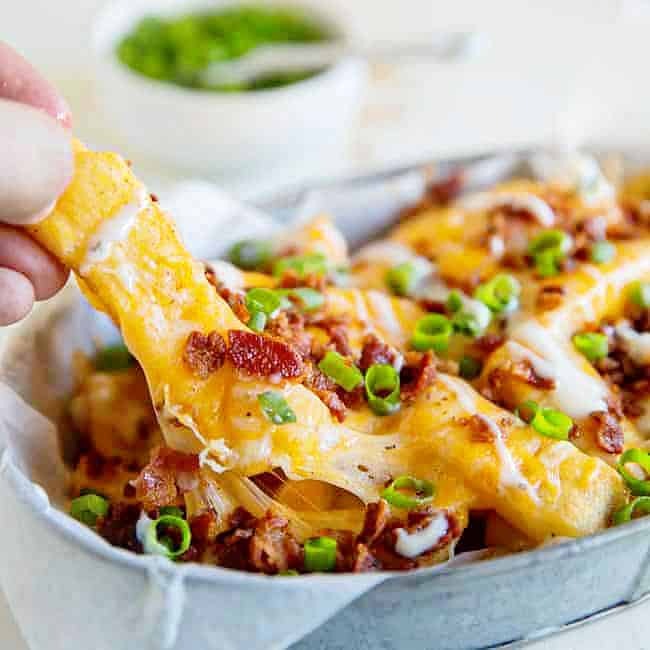 These Loaded Cheese Fries are an appetizer-lovers dream! 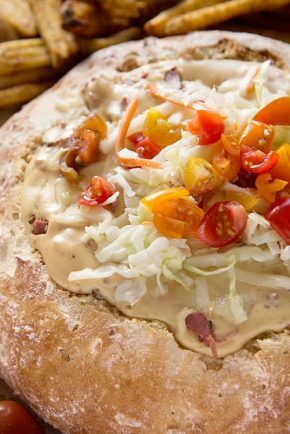 Packed with flavor and piled high with cheese and bacon, you will be licking your fingers with delight! 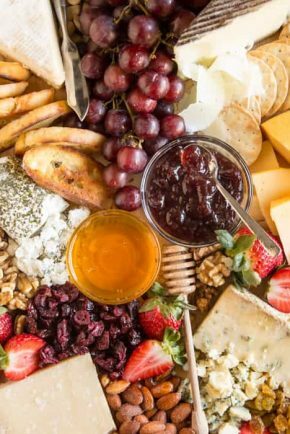 Want more Appetizers? I’ve got you covered! 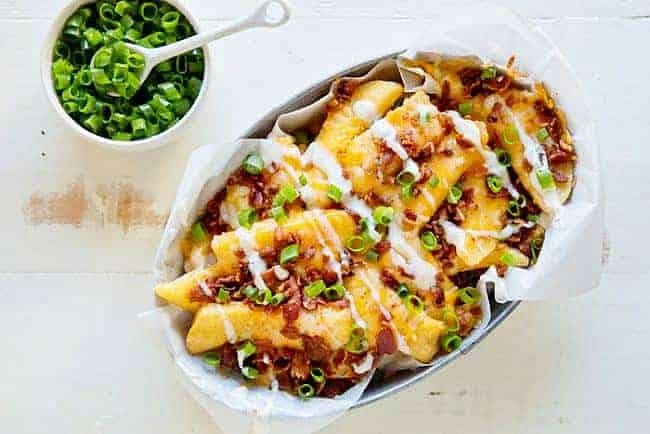 As good as French fries are on their own (or with fry sauce if I’m being honest), they are virtually irresistible once you add the trifecta of cheese, bacon, and ranch. These are so easy to make thanks to store-bought fries so you can make them any night of the week or for your biggest weekend parties. How do you make Loaded French Fries? Start with store-bought steak fries from the freezer section. Toss the steak fries with seasoned salt before baking for extra flavor. Then, bake until crispy on the outside and tender on the inside, about 40 minutes. What goes on Loaded Cheese Fries? Bacon. Glorious, perfect bacon. Fry and crumble 8 strips of bacon. When the fries are done, top with cheese and pop them back in the oven until the cheese is melted. Last, add the bacon bits, scallions, and a drizzle of ranch salad dressing. These Cheese Fries are better than your local steakhouse version! My favorite option is in a cast-iron skillet. Everything is better in a skillet, am I right? Not only does it look great, but the residual heat helps to keep the fries warm! If that is not an option, serving them right on the pan you baked them works great. If you happen to want to get fancy, find a great serving dish like the one we used above and line it with parchment or wax paper. Slide the fried right in, garnish, and serve! Preheat oven to 425°F degrees. Line a rimmed baking sheet with aluminum foil or parchment paper for easy cleanup. Add steak fries to prepared baking sheet in a single layer. Sprinkle with seasoned salt and toss to coat. Bake according to package directions, about 40 to 45 minutes. Meanwhile, fry bacon and drain on paper towels. Cool 10 minutes, then crumble. Remove fries from the oven. 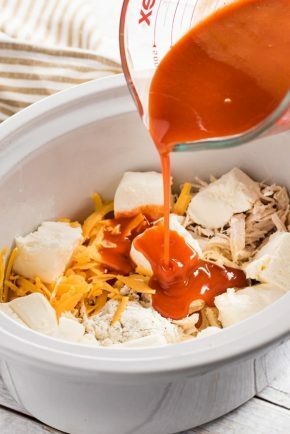 Top with shredded cheese and return to oven until cheese has melted, about 5 minutes longer. 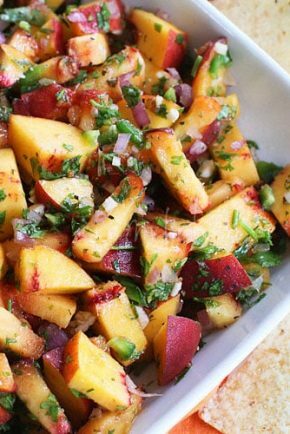 Remove from oven and sprinkle with bacon pieces and scallions. 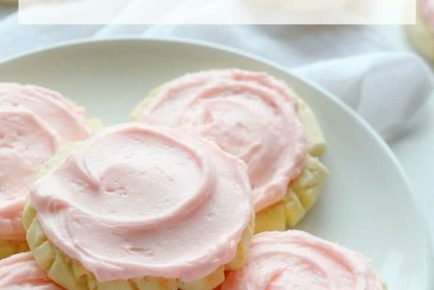 Drizzle with ranch dressing or pass separately. Serve hot. Born and raised in Wisconsin, I am bringing my Midwestern food memories to my delicious take on a modern family fare. There’s nothing I love more than cooking for my family, cooking for friends, cooking for every occasion! Food is love where I come from, and I’m spreading the love every day on Culinary Hill. 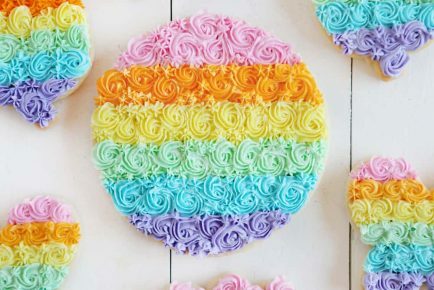 This looks really good but I need to know how many people this servers for math class I’m doing a project and I have to know this information. I need to know how many people it serves fo a math project it looks really good so I don’t wanna do it another recipe. As a matter of first importance Where has such scrumptiousness been all the 25 years of my LIFE?! That sounds astounding with the combo of the sweetness in the potato. No reasons… will attempt this one for supper. Why not… it is solid. This is an extraordinary friday night following an intense week supper… comfort sustenance to the outrageous. Much obliged to you to such an extent. Adore everything.